Time is running down with only 17 shopping days remaining until Christmas. With that in mind, offline and online retailers continue to knock a few bucks off of tech devices; this way they can attract some of those last minute shoppers.who are either procrastinators, or looking for the best bargains. 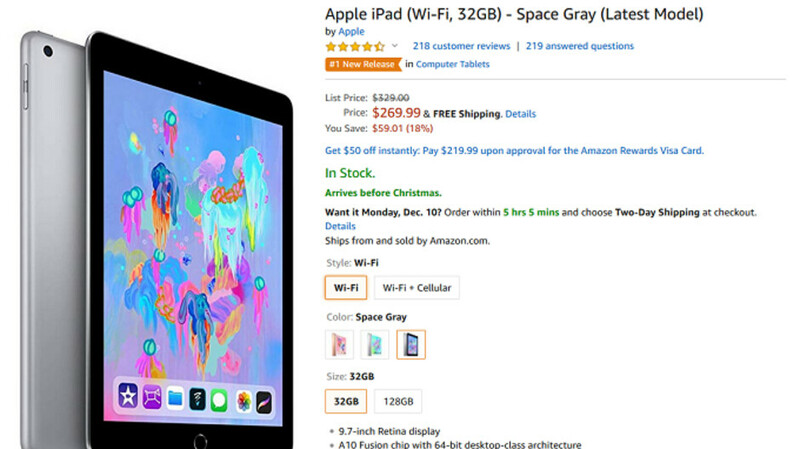 Now that Amazon itself is selling Apple devices, Apple Insider notes that the online retailer has some additional Apple devices on sale like the 9.7-inch Apple iPad (2018), 10.5-inch iPad Pro and the Series 3/4 Apple Watch. 9.7-inch Apple iPad (2018), 32GB, Wi-Fi only, Space Gray (save 18%). 9.7-inch Apple iPad (2018), 128GB, Wi-Fi only, Space Gray (save 18%). 9.7-inch Apple iPad (2018), 128GB, Wi-Fi only, Silver (save 18%). 10.5-inch Apple iPad Pro (2017), 64GB, Wi-Fi, Space-Gray (save 23%). Apple Watch Series 4, GPS only, 44mm, Silver Aluminum, White Sport Band (save 3.5%). Apple Watch Series 3, GPS+ Cellular, 38mm, Silver Aluminum, White Sport Band (save 13%). Apple Watch Series 3, GPS+ Cellular, 38mm, Space Gray Aluminum, Black Sport Band (save 13%). If you plan on buying one of the four tablets listed above, Amazon will sell you the Apple Pencil for $94.88, a 4% discount off the usual price. The accessory will work on all of the 2018 iPad models, and of course it is compatible with all iPad Pro tablets. We should also point out that if you order any of these devices from Amazon, shipping is free. Hmm the iPad at this price is tempting but I would need a new bag first.